From day one we understood the critical importance of working with reliable and proven partners and have built our value chain around it. From technology and software to marketing and order fulfillment, we work with industry leaders providing the best services possible at the best prices available. Magento is the Ecommerce software and platform trusted by the world’s leading brands. 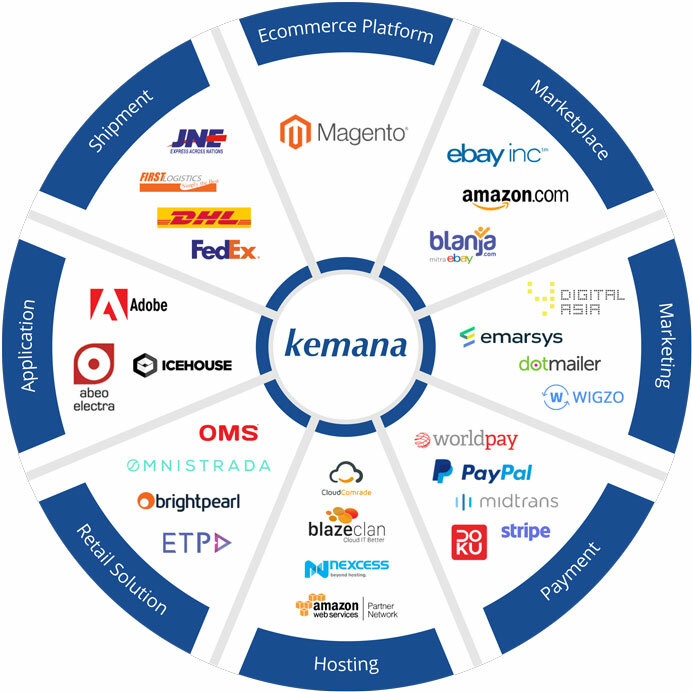 Kemana assists brands grow their online businesses with Magento. Adobe has historically focused upon the creation of multimedia and creativity software products (Photoshop, Illustrator, etc. ), with a more-recent foray towards rich Internet application software development. eBay (NASDAQ: EBAY) is the world’s most vibrant marketplace for discovering great value and unique selection. eBay connects millions of buyers and sellers. Nexcess’ hosting solutions are purpose-built for particular applications, so that you can consistently outperform the competition by 13X or greater. BlazeClan is a leading AWS Cloud Consulting Company, offering Cloud Migration, Managed Services, Data Warehouse, BigData on AWS. Cloud Comrade are an enterprise-focused Cloud computing consultancy dedicated to implementing the AWS Cloud infrastructure and building bespoke IT solutions for customers on top of the AWS base. ETP is a leading software company headquartered in Singapore delivering Omni-channel Retail Solutions to market leaders across more than 20 countries in Asia Pacific, India and the Middle East. Order Management Systems’ robust platform is an end-to-end solution providing customized online order management and logistics for international brands worldwide. Business management software from Brightpearl lets you manage the heart of your retail business, from ordering to shipping, all in one place. Braintree is an all-in-one solution to accept, process, and split payments in your mobile app or online from small business to large enterprise. Paypal is the safest way to complete online transactions and send money, easily & reliably. Payment Gateway Solution for eCommerce merchants in Indonesia to send and receive online payment with credit/debit card, internet and mobile banking. Established in 2007, DOKU is the first and largest independent electronic payment solutions provider in the country. With a strong focus on innovation, we strive to provide the most secure and convenient solutions for both business and personal needs. YDigital is a digital marketing agency in Indonesia with data driven expertise in highly measurable Search Engine Marketing, Paid and Natural Search, Display and more. Blanja.com, a joint venture between eBay and Telkom, is a leading online marketplace in Indonesia where the buying and selling process is safe, cheap and reliable. Amazon.com is the world’s largest online retailer of books, movies, music and games along with electronics, toys, apparel, sports, tools, groceries and general home and garden items. JNE is an express and logistics courier services company, originated from Indonesia. Its official name is Tiki Jalur Nugraha Ekakurir. Nowadays, Tiki JNE is better known as JNE. First Logistics is an Indonesian Domestic Courier and Express Logistics Company servicing numerous Ecommerce clients and customers across the country. DHL Express is a division of the German logistics company Deutsche Post DHL providing international express mail services. Deutsche Post DHL is the world’s largest logistics company operating around the world, particularly in sea and air mail. OmniStrada elaborates and delivers digital and omnichannel strategies that transform existing businesses or develop new business opportunities. Dotmailer is an online marketing company that provides a leading marketing automation platform with email at its core. Its mission is to empower marketers with the tools that make it easy to get dramatic results, every time. Ice House is a mobile app development company that applies breakthrough technology, engineering excellence and Silicon Valley (market) insight(s) to provide mobile solutions. Wigzo’s solutions help to create personalized experiences across all customer touchpoints from a single, integrated digital marketing platform. Smart marketing automation and personalization to focus on customer engagement and growth.